Reflecting their creators’ desire to step far, far away from the sheepish architectural clones that our culture has grown to accept as “normal”, these outstanding structures are among the unique global jewels that convey a quirky sense of personality tucked within an even more wackadoodle shell. 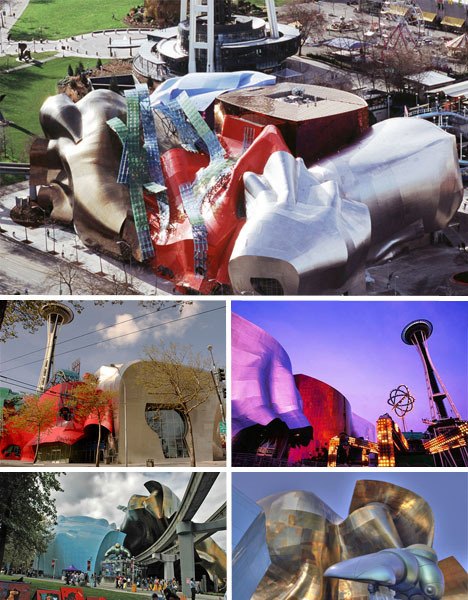 While it may be hip to be square, these slightly left of center buildings demonstrate that marching to the beat of one’s own drummer – whether you’re of the animal, vegetable, mineral or architectural persuasion – is actually a whole lot more fun. 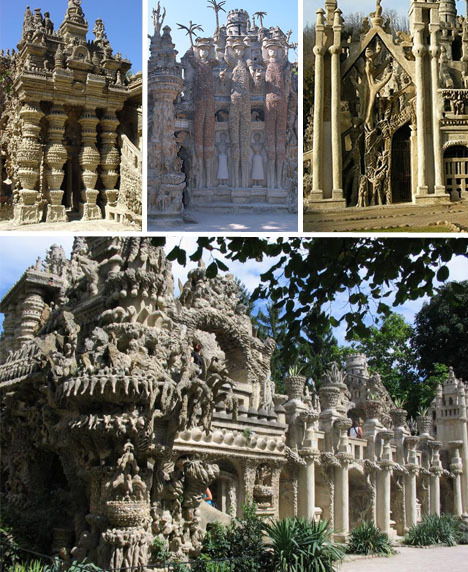 Throughout a 33 year period, rural postman Ferdinand Cheval – who lacked any architectural background whatsoever – collected all the individual stones necessary to create his elaborate carved limestone and shell studded structure via pocket, basket and wheelbarrow. 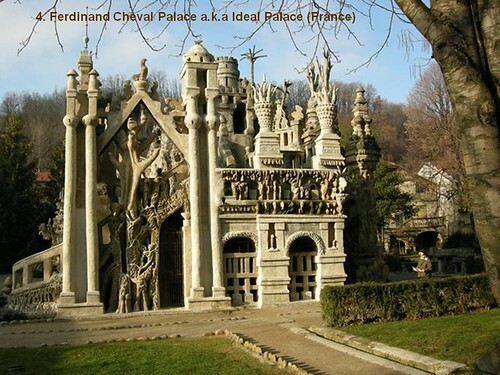 Incorporating a bizarre conglomeration of architectural styles inspired by Hindu and Biblical mythology as well as Algerian, Northern European and Chinese elements, he finally completed his outstandingly quirky monument just one year before his death in 1924 at the age of 88. 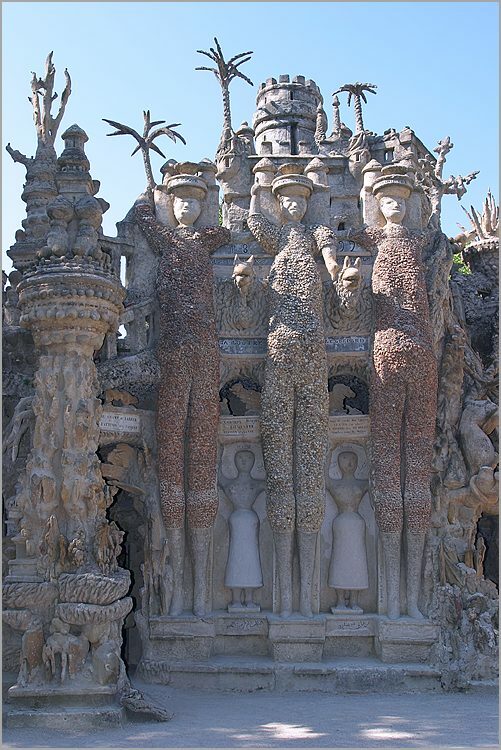 Grottos, flying buttresses and statues of animals collide in what is today one of the most outstanding examples of “naïve art” architecture and France’s most beloved cultural landmark. 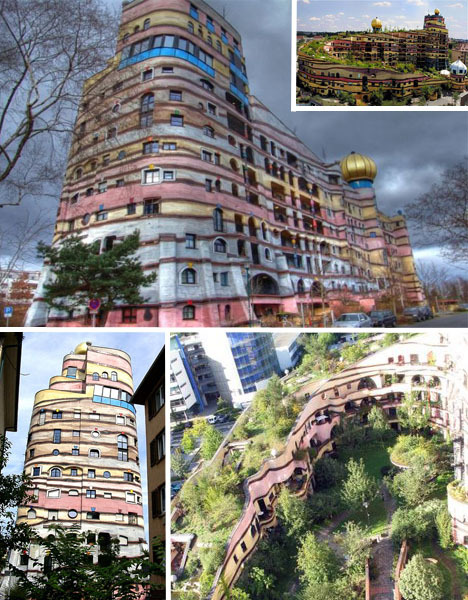 Viennese architect and painter Friedensreich Hundertwasser conceived of this fantastical, U-shaped, multi-earth-toned 12 floor residential building complex which emulates the layers of sedimentary rock that you might see in a jutting outcrop deep in the mountains. 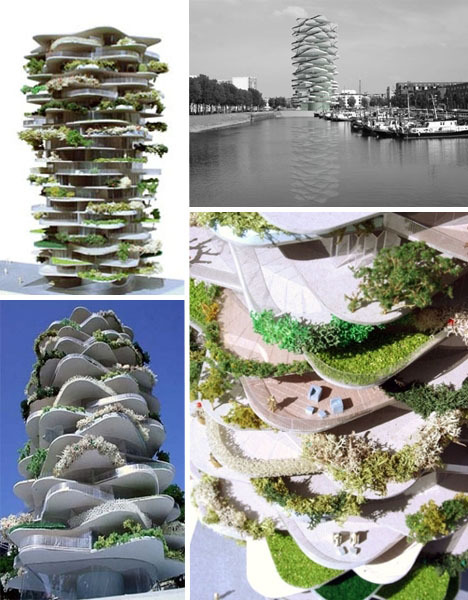 Completed just 10 years ago, his “Forest Spiral” features 105 apartments, 1000 different shaped windows, a café/bar, an inner courtyard with an artificial lake plus a diagonal green roof studded with botanical elements such as trees, grass, shrubs and flowers. 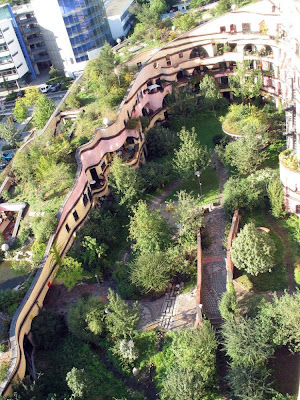 Built by the Bauverein Darmstadt company, it currently serves as the home base for hundreds of lucky German residents. 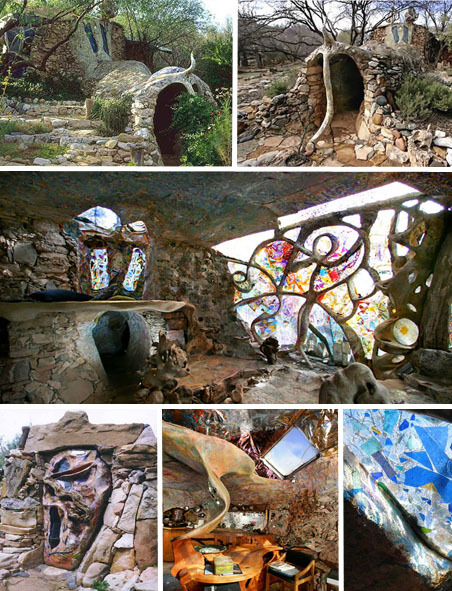 An exercise in artistically imaginative organic architecture, this dwelling – built into 3 acres of natural Arizona landscape by husband-wife team Michael Kahn and Leda Livant – would likely trigger Seussian envy in Theodor Geisel himself. 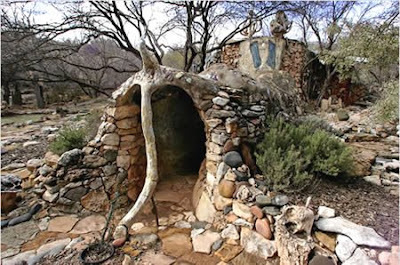 Consisting of five separate hand-crafted structures linked together by their shared idiosyncratic themes, the main living quarters are housed within Eliphante and connected to a meditation zone, art gallery, bath house, sculpture garden and wading pond. 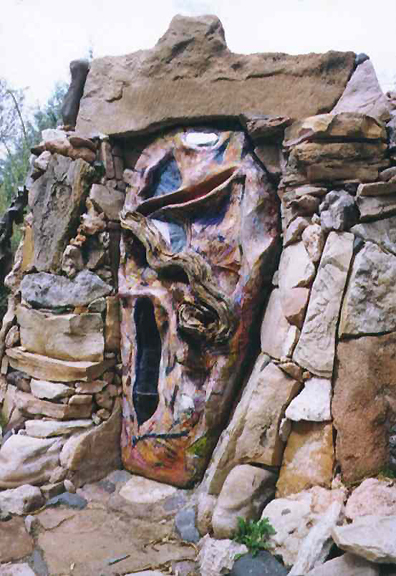 Raw materials were scavenged from the desert and integrated into the homestead with decisive artistic flair along with stone and glass mosaics, wood, tile, plaster and metal sculptures, yielding a one-of-a-kind home that lives, breathes and communes with Mother Nature. 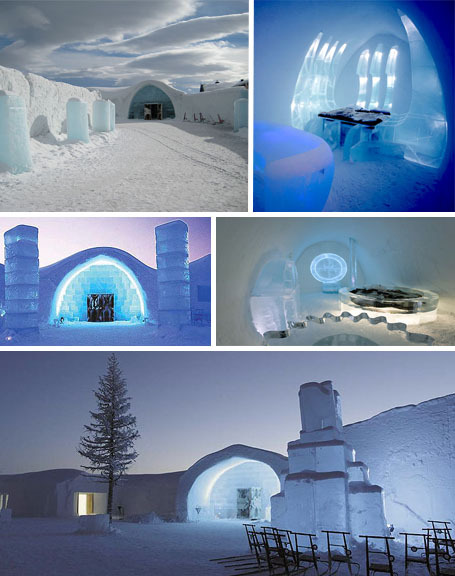 Quite like short-lived, seasonal treasures such as the emergence of cherry blossoms that are here today and gone tomorrow, Jukkasjärvi’s Ice Hotel exists just 4 brief months out of every year. 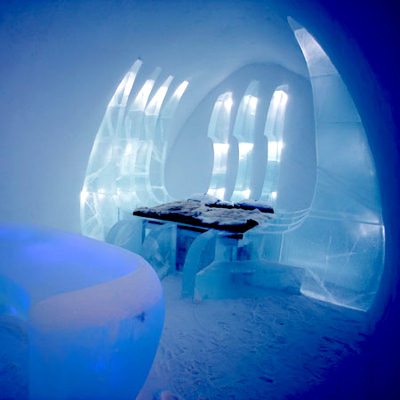 The nearby Torne River is relieved of tons of its ice, which is then used along with well over 30,000 tons of snow to form the ethereal exterior structure, central supports, shimmering rooms and infamously surreal ice bar. At the end of the spring, what remains is recycled and stored for next year’s incarnation — which is just one of several eco-friendly efforts (including self-generated renewable energy) that add to the hotel’s carbon negative aspirations that they intend to achieve by 2015. Known for its rolling emerald hills dotted with what can only be described as a sea of terrestrial sheep, it’s rather fitting that in a land where wooly creatures out number humans twelve to one that Tirau boasts the world’s only known corrugated iron sheep-shaped structure along with a companion sheep dog version. 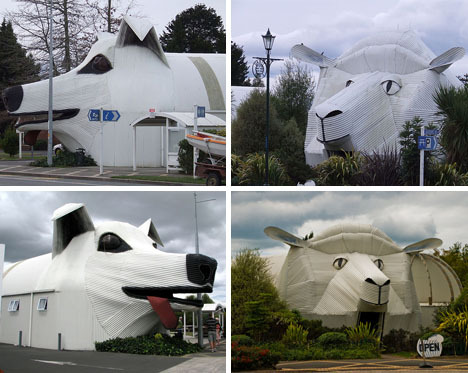 Housing a wool and craft shop, the sheep building provides a perfect complement to its canine compadre (which happens to be the location of the town’s i-SITE Visitor Information Center). 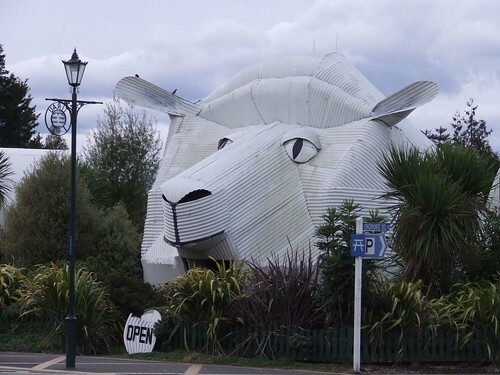 Both are crafted by local artist Steven Clothier, the brains behind “Corrugated Creations” and the reason why this small New Zealand locale is now covered with hundreds of smaller scale but equally quirky iron sculptures. Rising up into the sky like an alien urban desert invader, this 19 floor Rotterdam high rise offers city dwellers an opportunity to get their funk on along with their green thumbs. 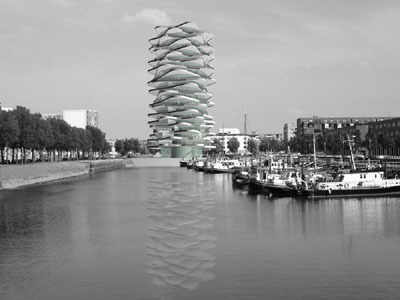 Conjured up by the visionary design team at UCX Architects, the graduating structure with star-shaped levels enables natural light to stream through the living spaces while also offering residents access to ample outdoor patio areas, all while overlooking the Rotterdam Harbor. Sounds and looks divine! 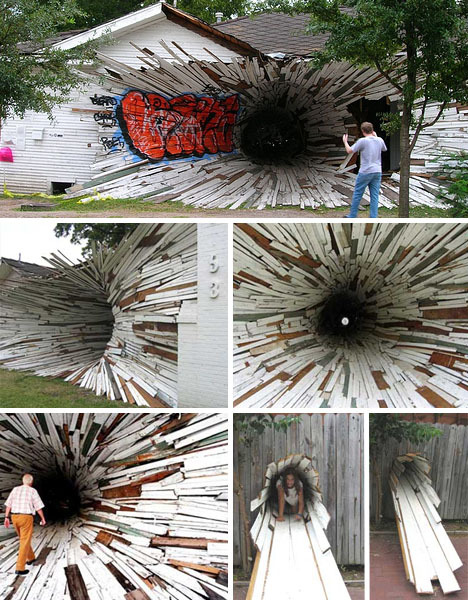 Prior to its imminent demolition, the Houston-based art trio of Kate Petley, Dan Havel and Dean Ruck decided to make the most of a doomed dwelling in a Montrose neighborhood by transforming it into a short lived but very memorable installation called “The Tunnel” or “Hole” house. 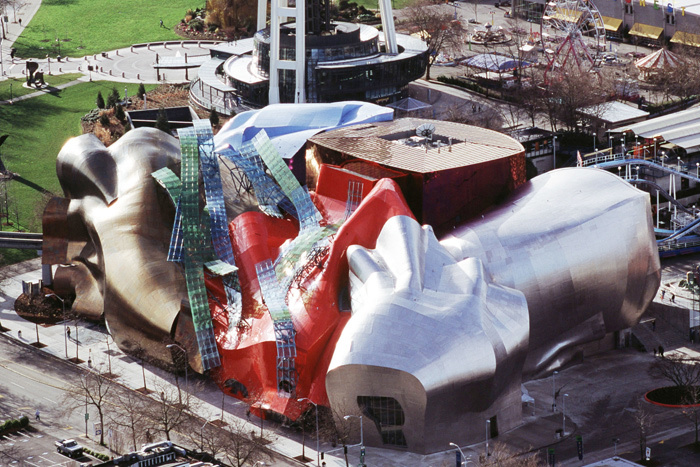 With its central vortex narrowing into a tunnel that spilled out into the exterior of the structure, local spectators were able to experience their own personal Alice in Wonderland fantasies (or nightmares as the case may be) before the whole thing was leveled in 2005. 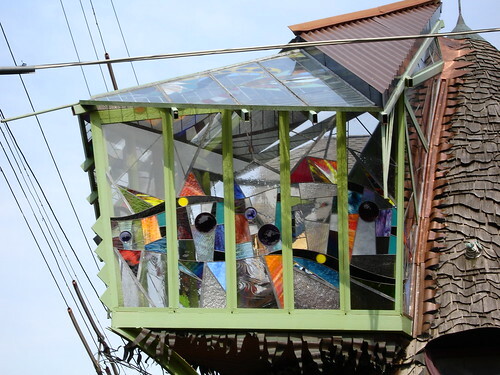 Sprouting up in Cincinnati’s Hyde Park section, professor of Architecture and Interior Design Terry Brown – along with his students – hand crafted this one bedroom residence throughout a period of 14 years until its completion in 2006, at which time it was put on the market for $525,000. 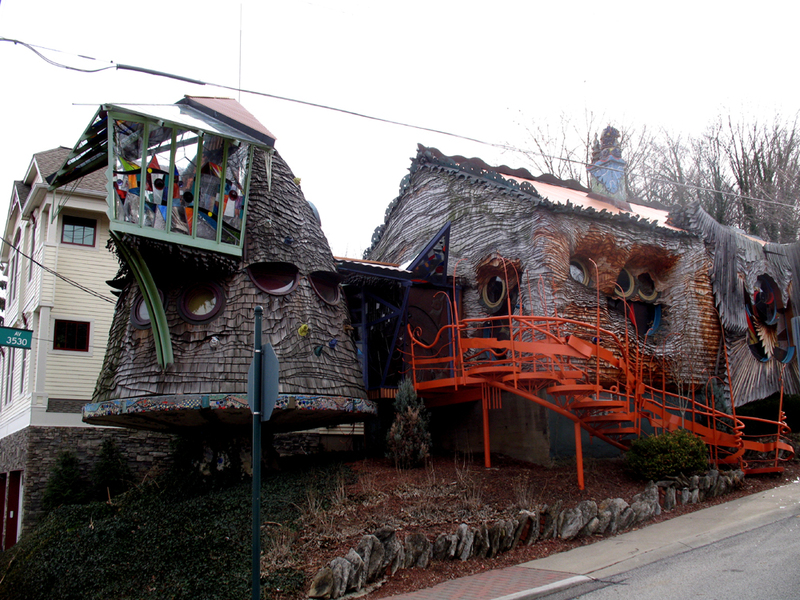 Sadly, Brown met his untimely demise just two years later in a car accident, but his Mushroom House – constructed with multiple types of metals, tinted glass, ceramics, wood and shell – serves as his most outstanding legacy and one of Cincinnati’s most esteemed landmarks. 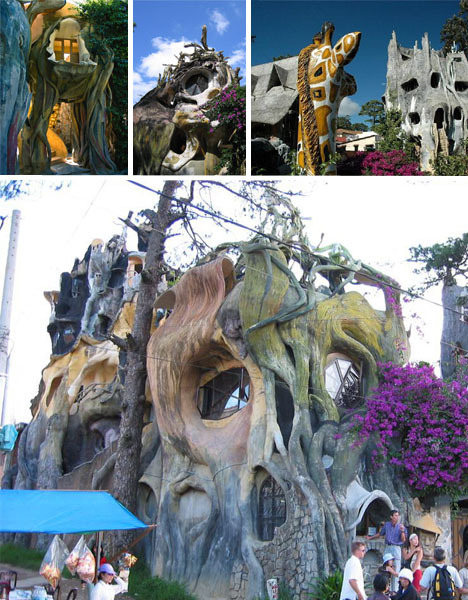 Tumbling out of the imagination of architect Dang Viet Nga, Hang Nga’s Guesthouse and Gallery is…well…all sorts of crazy, from its rustic tree-like base with spiderweb windows to winding, nook-and-cranny laden interior that promises to keep you guessing at every turn. 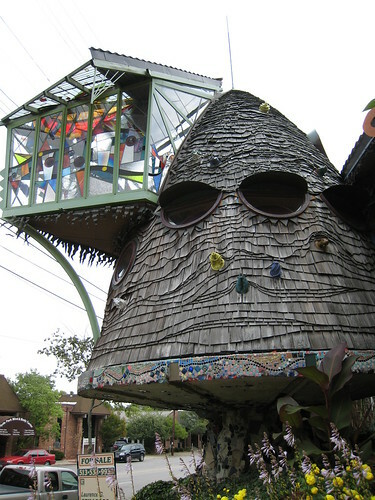 The artsy designer and daughter of Vietnam’s former president tapped into her entrepreneurial spirit by wisely charging admission to the storybook structure, knowing full well that spectators would happily gobble up its funhouse like details, including seemingly melting interior and exterior facades punctuated by somewhat goofy ‘what are THEY doing here?’ zoo animals keeping a watchful, protective eye upon the premises. 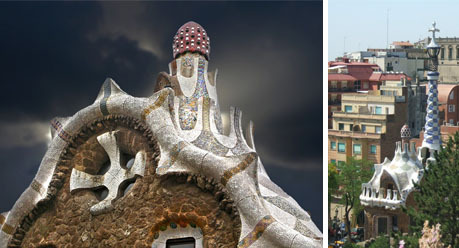 Spanish Catalan architect Antoni Gaudi, known for his fantastically original architectural works that can be found throughout Barcelona, incorporated intriguing mythological imagery within his Park Güell, including an outstanding colorful mosaic lizard and a sea serpent-shaped bench which took its unforgettable form thanks to the impression of a woman’s curvaceous derriere in the wet clay. 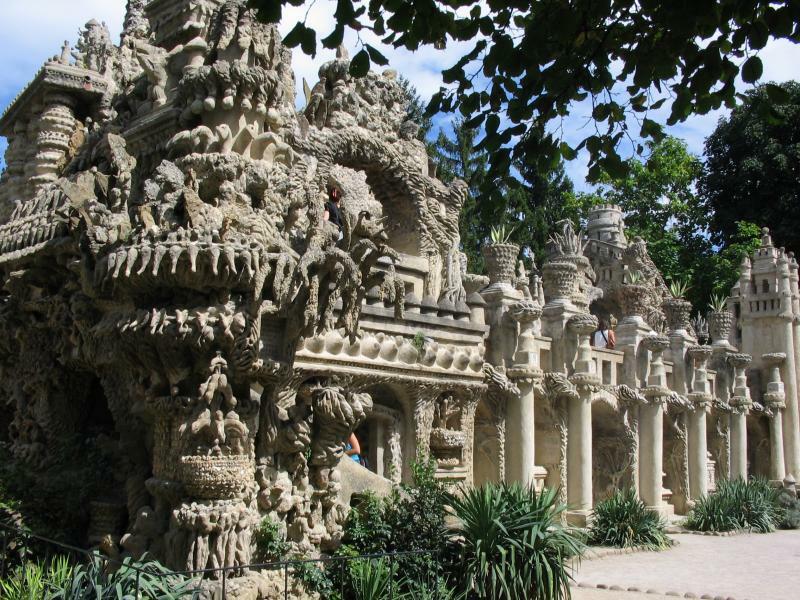 Slightly more memorable than his naked buttock design technique is the overall gingerbread-like layout of his enchanting city garden boasting a thicket of 88 twisted rock pillars along with meandering walkways that appear to exist symbiotically with the lush green landscape. 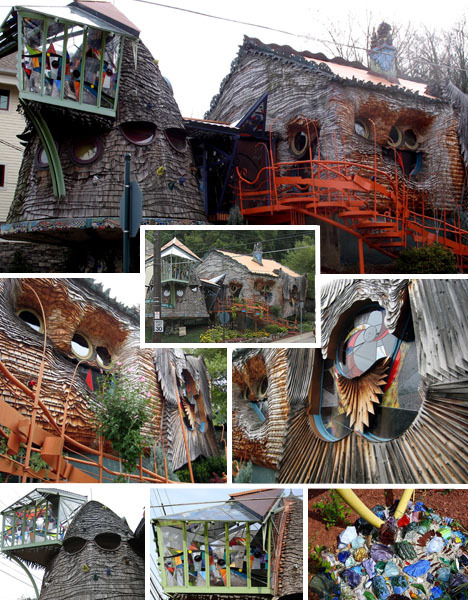 Serving as the focal point of the sprawling botanical zone is the Pavilion or Mind House, a rock studded masterpiece with whimsical jesture-like roof crowned by a polka-dotted mushroom shaped turret. 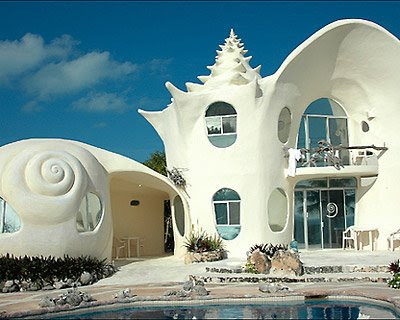 Located just 20 minutes away from Cancun, this Carribbean Ocean-surrounded oasis — crafted by Octavio Ocampo — certainly leaves a distinctive impression with its 180 degree ocean views and seashell inspired design. The 5500 square foot dwelling, incorporating concrete as well as structural materials plucked straight from the beach and surrounding region, has no angles…just smooth flowing lines that mirror real seashells. 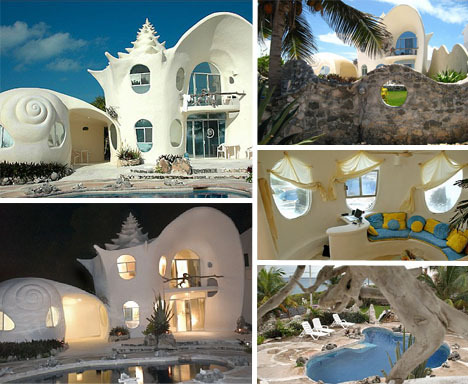 With an interior that is just as alluring as its façade (thanks to creative design details that make the most of real coral and assorted conch shells), Ocampo’s structure – which is available for vacation rentals – offers a true escape into an ocean bound paradise. We’ve all seen the ritz and glitz of modern casinos, so this entry may not seem like it’s treading unchartered waters, however the Dennis Lua and Ng Chun Man-designed structure happens to be among the world’s tallest skyscrapers…so that’s somethin’. 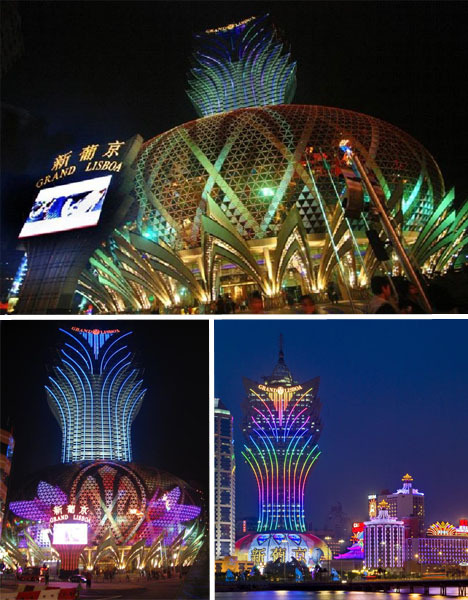 An eight-story spherical platform pulsing with ostentatiously gaudy neon lights supports an equally Liberace-like lotus leaf, providing onlookers with seductive eye candy which baits them into gambling their cares and bank accounts away. With 58 floors of 5 star debauchery, the $375 million dollar project is said to be among the most opulent, in part due to the ample bling scattered throughout…such as crystal balls, 580,000 Swarovski crystals, gold leaf accents and the permanent display of a flawless 218 carat diamond called the Star of Stanley Ho. 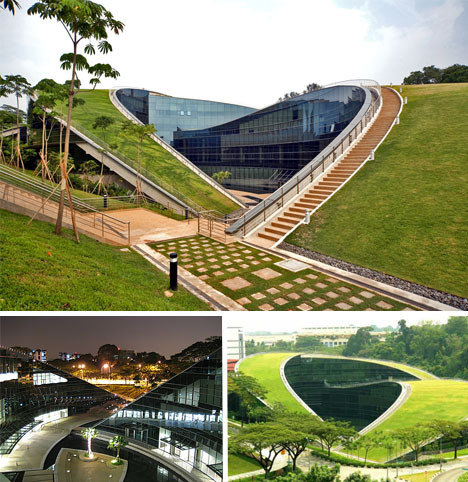 Blurring the line between nature and architecture, this 5 story learning institute is an outstanding example of green construction with its fluid, grassy roof which appears to nestle its inner structure with a protective hug. 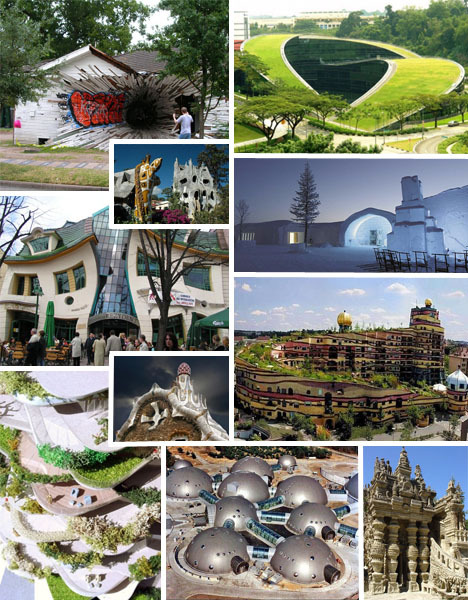 Amid an urban landscape traditionally studded with buildings that automatically conduct heat, CPG Consultants’ award-winning design offers innate cooling properties along with a roof top rainwater harvesting system and smart sensors that only hydrate the greenery when necessary. 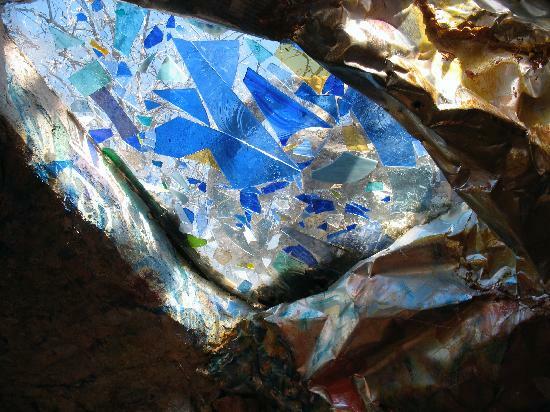 It almost seems as though the glass, concrete and metal structure is carved into its wooded valley, acting as a natural extension of what Mother Nature was like long before man stepped into the mix. 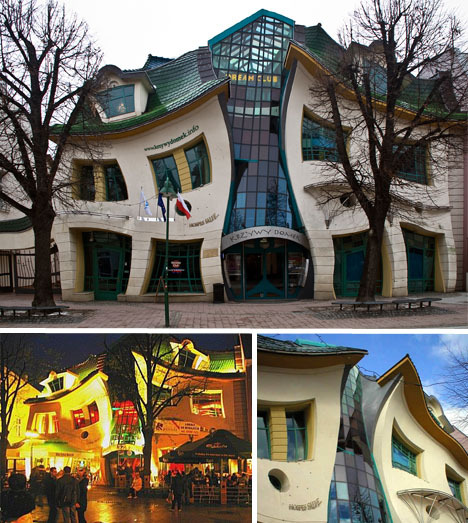 With little elbow room to breathe due to its curious location amid a long string of boutiques and cafes in Sopot’s Rezydent shopping center, it’s not surprising that architect Szotynscy Zaleski’s 4000 square meter cartoonish structure is suffering from a serious squish factor. 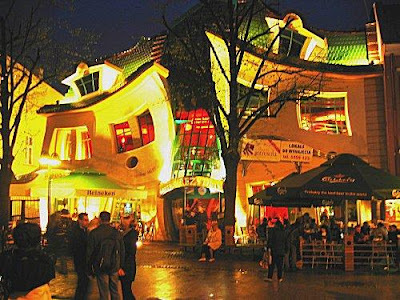 However, it’s all by design and reflective of the art of Per Dahlberg and Jan Marcin Szancer, both of whom created fanciful scenes that are brought to life in The Crooked House’s off-kilter lines and somewhat saggy overall demeanor. 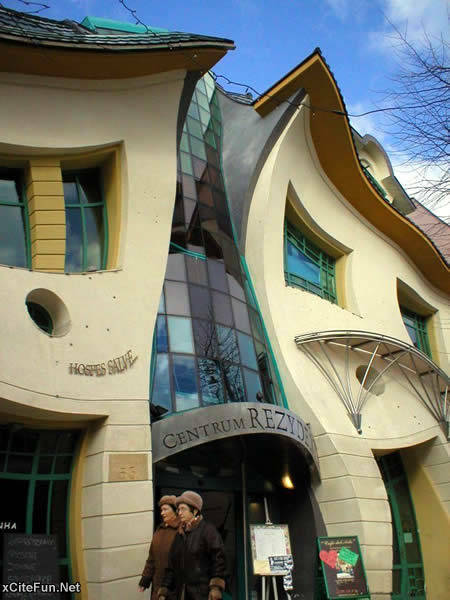 Containing three stories packed to the gills with shops, restaurants, bars and a handful of touristy sites, Zaleski’s most photographed landmark is memorable just as much for its quirky appearance as it is for its sheer artistry and rather pitiful, gravity-succumbing sadness.